Shyrone Kaur Singh is one of Dya Singh World Music Group's North American organizers and publicists. She also volunteers with the Sikh Mediawatch and Resource Task Force (S.M.A.R.T. ), a non-profit organization dedicated to the fair and accurate portrayal of Sikh Americans and the Sikh religion in the American media and society. Additionally, she is the moderator and founder of SikhCyberSangat, an Internet discussion group hosted by Yahoo! Groups. She enjoys travel and lives in Baltimore, Maryland. The following has been edited for clarity. "Over the past three years I have assisted with the coordination of Dya Singh's U.S. tours and traveled with the Dya Singh World Music Group on some of their North American journeys. I have always been amazed at Dya Singh's high energy level and aspirations to spread a very positive and vibrant message among modern Sikh youth worldwide." "However, Dya Singh is frowned upon by Sikh 'traditionalists' for not being a 'conformist' of 'expected norms' such as traditionally accepted attire - kurta-pyjama or baana [attire] - as is expected of a Sikh religious kirtani [hymn singer] or limiting the singing of kirtan to Sikh sangats [communities] and in the prescribed raags [similar to symphonies]." "Nonetheless, Dya Singh follows the traditions of Guru Nanak as he travels throughout the world sharing Sikh music with people of many different faiths and cultures. He helps to spread the universal message and spirit of the Sikh faith by performing kirtan, using both Gurmukhi and English translations. Nor does Dya Singh believe that kirtan should be confined to the walls of gurdwaras [Sikh places of worship]. 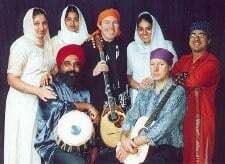 Thus, he presents kirtan in an upbeat World Music style in various venues - taking Sikh music to the world, and bringing World Music to the Sikhs. Sikh youth in search for 21st-century role models seem to enjoy listening to and interacting with Dya Singh, his two daughters, and the accompanying group of non-Sikh musicians." "I am often inspired by Dya Singh's kirtan. His latest release, Dya Singh-Along, inspired me to write about him. Indeed, many people have referred to Dya Singh as a Pied Piper."